Saroja trained under the accomplished Guru Lalitha of Saraswati Gana Nilayam, Chennai, is the third generation disciple of the famous Guru Kattumannar Muthukumaran Pillai. She has also undergone training in Carnatic Music under Prof. P. Sambamoorthy at the Madras University. Saroja is today one of India Prominent Bharatanatyam exponents who has earned her fame as an intelligent. creative and innovative choreographer, dancer and guru. As a Professional Dancer: Has traveled all over India and abroad and has given recitals and leedems besides having conducted workshops As an Author: Has published three scholarly art book on Bharatanatyam and Carnatic Music. As a Choreographer: Has choreographed over a score of enthralling ballets on mythology and social themes that have been very well appreciated by the audience and the media. In her long and illustrious career. She has received several prestigious national and state awards including the Padmashri from the Government of the India, the Delhi State Award from Sahitya Kala Parishad and the Kalaimamani from the Government of Tamil Nadhu. 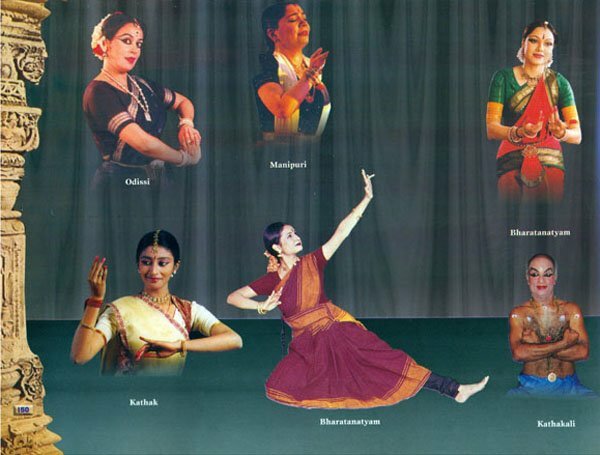 She has done extensive research on a project “Encyclopaedia of Bharatanatyam” for the NCERT. She is the recipient of a Senior Fellowship from the Government of India, besides beings a Paul Harris Fellow instituted by the International Rotary Club. As a Guru: Has groomed several disciples who apart from being professional dancers have also established dance centres all over the world . Has established a fine arts institutions. Ganesa Natyalaya. in 1974 which has own building in south Delhi. 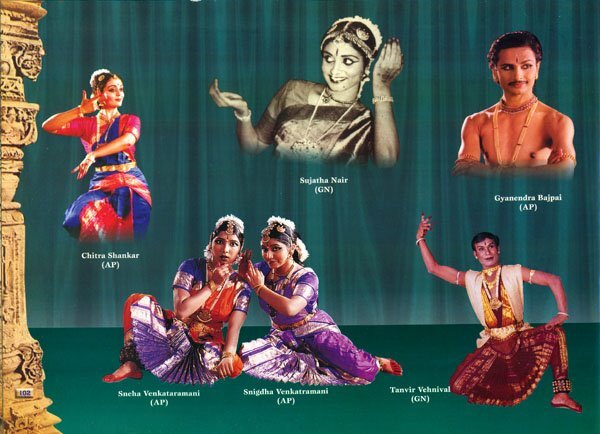 Saroja Vaidyanathan's book is the latest in a series of excellent publications that have come out recently on the glorious panorama of Indian classical dances. Herself a talented performer and teacher, Saroja has presented the various classical dance forms along with photographs relating to eminent gurus and practitioners in each of these forms. In his great work, the Natyashastra, the sage Bharata has described dance as the highest form of devotion to the divine. The concept of Shiva Nataraja, Lord of the Cosmic Dance, is one of the most powerful images in world iconography. Indeed the whole of the cosmos is in a constant state of movement, whether it is majestic circulation of the galaxies or the sub-atomic dance of the tiniest particles of energy, there is movement everywhere. Indian classical dance seeks to capture this movement and present it clothed in beauty and grace. Bharatanatyam, particularly, is the crest jewel of Indian dance. Combining the three syllables 'Bh' for Motion, 'Ra' for Raga or melody and 'Ta' for Tala or rhythm, it is in the combination of these three elements that the dance emerges. Saroja Vaidyanathan is to be complemented for having produced a readable and well-illustrated publication, which I am sure will be welcomed by students of Indian dance in the country and abroad. 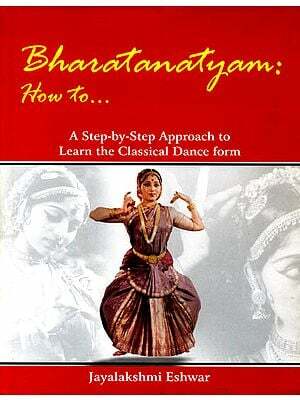 After having ventured through various aspects, angles and explored research in the classical dance form of Bharatanatyam which resulted in books like "The Science of Bharatanatyam" and "Bharatanaytam - An In-Depth Study", my interest now has widened. The Indian classical dance forms, with their deep aesthetic methodical and scientific presentation along with the sparkling costume and jewels, have generated an ever-growing interest the world over in dances of India. Unless one first finds something easy to comprehend one does not acquire the interest to explore it. This was my basic motive behind the book "Classical Dances of India". I wanted the various dance-forms to be understood in a manner which will generate further interest in the reader's mind. 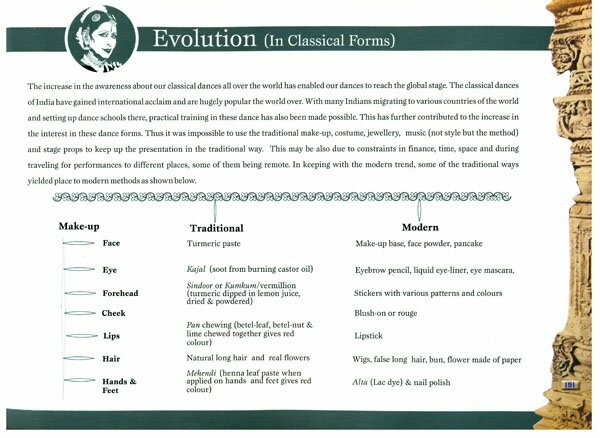 The eight Indian dance forms that have a "classical" status have been studied here in detail to give a brief yet lucid explanation of their origin, their style and techniques along with a mention of the corresponding jewellery, costume, make-up and music, so as to make it a comprehensive study. Further, simple expressions have been used in conjunction with coloured photographs, charts and maps to leave a clear and lasting visual perception. 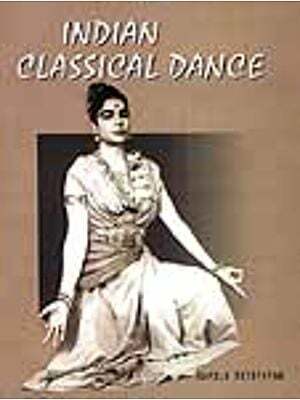 It is my sincere hope that this book on the classical dance- forms gets embedded in the reader's mind thereby keeping the torch of Indian culture burning. I have made an earnest attempt to mention all the eminent scholars and practitioners of the various dance forms, some of whose photographs have been printed. Needless to say the non-inclusion of the photographs or names of some great artistes do not make them any less eminent. The broad objective was to acquaint the readers with all such persons who have spent a lifetime devoted to classical dance. My personal gratitude is extended to all my colleagues, famous for their professionalism and immense contribution to their respective classical dance forms, for their guidance regarding the nuances and intricacies of their respective classical dance forms. Though they are all very well known, experienced and established artistes and gurus in their respective fields, their willingness and enthusiasm to share and spread the culture deeply moved me. My thanks also goes out to my dear senior students for their unflinching support. Due to the awareness of our cultural heritage in this century, many young talented professional dancers, gurus and renowned authors are establishing and spreading the Indian classical dances within India and also the world over. Lastly, I wish to dedicate this book of mine to my gurus Smt. Lalithamma and Prof. P. Sambamoorthy. Our world, the planets and even the universe, in a broad sense, are composed of the five prime elements or the Pancha Bhoota namely fire, water, wind, earth and the sky or ether. Our ancestors recognized and greatly respected this concept of the Pancha Bhoota. In fact, this holy faith and recognition led to the deification of not only these elements but their earthly manifestations as well. These natural forces soon influenced the life of man and the various societies and cultures of the world came to grow under this influence. Culture indicates a fusion of several aspects of life and civilization of the people. 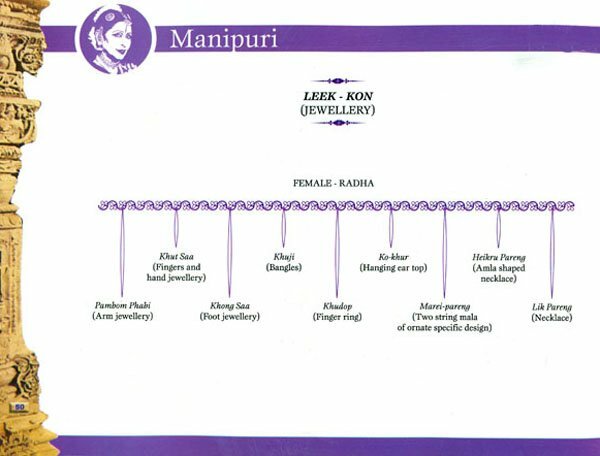 It includes within its fold, various aspects such as religion, language, attitudes, mannerisms, behaviour, attire and so on. An essential aspect or ingredient that helps to distinguish among different cultures are their art forms like dance, music, painting and sculpture. Dance is primarily inspired by the cosmic concept of motion of the universe in a definite pattern. Dance forms are essential parts of life itself, as it is an expression of the inner self. In India, dance is performed on all auspicious occasions like childbirth, marriage, harvest, etc. Tribal and folk dances are spontaneous expressions of joy shared by the entire community. Dance is interdependent with other aspects of culture such as music, painting and sculpture. Sculptures and paintings have helped us preserve our performing arts, especially dance. 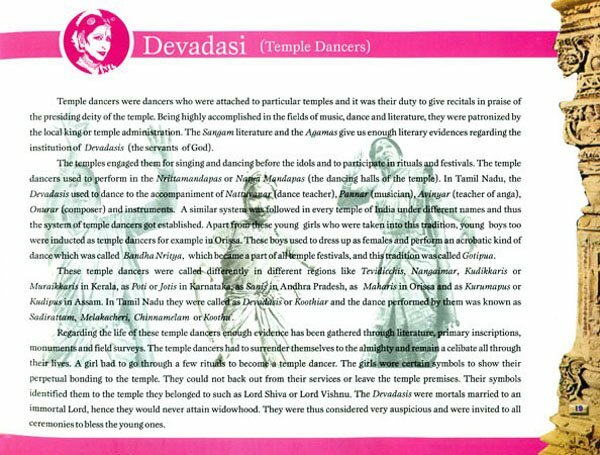 It is due to the vision of the sculptors and the paintings by great artists that the numerous dance poses on the temple walls are based on, thus making the study of the dance forms possible. These visual representations have facilitated the understanding of the written text as well. Dance in India evolves from divinity. 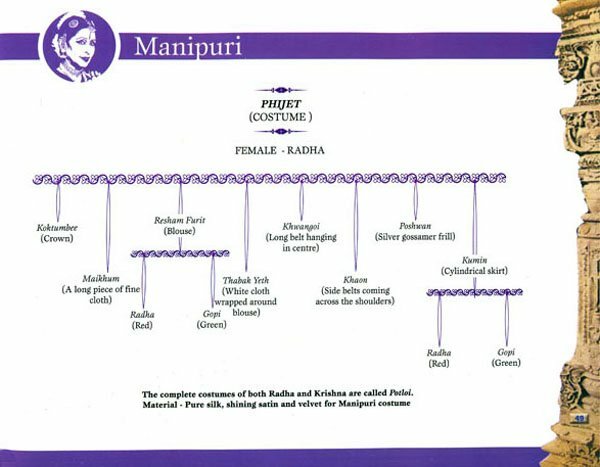 Bhakti and religion have primarily influenced our classical dances, which were mainly performed in the temple courtyards or a specially built performing area within the precincts of the temple known as the Mandapa. These classical dances mostly depicted stories from epics, Puranas and other mythological accounts, thus making dance a convenient medium for the people to understand such themes. Dance has been linked mainly with the gods and goddesses for generations in India. Major art forms such as dance and music have their own patron deity. For instance, Lord Shiva, the lord of dance is called Nataraja (nata-dance and raja-king) and Devi Saraswati is worshipped as the goddess of music. The Shiva temples of India depict various tandava poses of Lord Nataraja. The Pancha Bhoota (five elements) are possessed by Lord Shiva -Agni (fire) in his left hand, Ganga (water) in his tresses, Moon (space) on his head, Damaru (wind) in his right hand and his right foot resting on Prithvi (earth). Shiva is said to have been the first teacher of the oldest system of music and dance in India. A number of treatises on music and dance refers to the Shiva school of music and dance that seems to have been derived from a Pre-Aryan civilization. Saint Narada is said to have given vocal support when Shiva was dancing the Tandava and Parvathi, his consort, doing the Lasya (presentation of soft expressions). In India, there are various natya sabhas (dancing halls) situated in different temples where Lord Shiva is supposed to have performed the various forms of the tandava for his devotees. Some forms of the tandava include the Ananda tandava, Sandhya tandava, Roudra tandava, Shakti tandava, Tripura tandava, Ardhanari tandava, Muni tandava and so on. Lord Shiva is credited with five basic activities (Panchakriya) namely Srishti, Sthithi, Laya, Tirohhava and Anugraha. Another interpretation is that the drum in Lord Nataraja's right hand denotes Nadahrahma signifying srishti (creation) since it is believed that life starts from Nada or Dhwani i.e. the first sound. The fire in his left hand indicates laya (destruction). The second right hand is in ahhaya hasta -anugraha (blessings) showing the Lord's blessings and protection from the evil. The second left hand in dola hasta points to his raised left foot calling for complete surrender to him and the right leg tramples down or samhara (destroys) evils like kama (passion or desire), krodha (anger), lohha (greed), moha (delusion), mada (ego, pride) and matsarya (jealousy). The circular frame around the image shows the continuing cycle of life and death in this world until one attains final moksha (salvation). As a consequence, Brahma created the fifth Veda, the Natya Veda, which imbibed and synthesized the compositions from Rigveda, the expressions from Yajurveda, the music from Samaveda and the rasa of Atharvaveda to form the Shastra. The fact that it synthesizes the best elements of the four Vedas raises it to the position of the Natya Veda. The great text Natya Shastra was written by Bharata Muni with the help of Brahma and other great scholars after witnessing Lord Shiva's cosmic dance, the Tandava, and his consort Parvati 's Lasya. 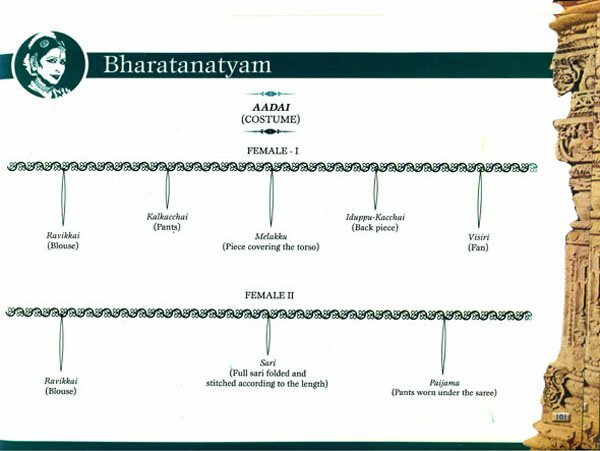 The Natya Shastra compiled by Bharata Muni may be regarded as the basic guide to dances in India. The different classical dances in India follow the Shastra according to their requirement. For instance, some dance forms concentrate more on elaborate make-up and costumes, such as Kathakali, Yakshagana, Purulia Chau whereas some dance-forms like Kathak or Sattriya dance do not. Dance can be distinguished primarily as classical or folk. Classical dance is based upon certain specific metrics, adhering to a certain basic discipline and set of rules. Though it draws its basic tenets from the culture of its region, it is however not essential to belong to that culture to understand the subtle nuances of the dance. Knowledge of the Shastra and the other rules guiding the dance is the requirement. Classical dances command a great dedication and discipline from its performers. Classical dance in India has been closely associated with divine worship. It is beautiful and ecstatic in its manner of offering homage to the pantheon of Gods. In its form and structure, we can discern an order and rhythm, perfection and harmony, consistent with cosmic order. The rare image of the dancing girl excavated from Mohenjo Daro in particular establishes the antiquity of this form. Classical dance forms in India include Bharatanatyam - a subtle and sophisticated dance from the southern part of India; Kathak - a narrative form of dance interspersed with quicksilver footwork; Odissi - originating from the temple dances of Orissa and characterized by the frequent use of the Tribhanga position; Manipuri - a dance form from eastern part of India employing the primary theme of Krishna's Rasa Kreeda; Kathakali - the mythological mimic dance drama of Kerala; Mohini Attam - a unique lasya based dance form specially conceived for female dancers and Kuchipudi - originally performed only by men, it makes use of fast rhythmic footwork and sculpturesque body movements. Apart from these classical dance forms, India also boasts of a rich plethora of folk dance forms, with each region displaying its unique flavour in every such folk dance form, some regions even boasting of more than one such dance form. These folk dances are mostly spontaneous and are performed at all auspicious occasions and festivals, the village level onwards. Though they follow certain rules of the shastra, folk dances are more region and culture specific. It requires knowledge of the particular culture to understand the meaning and expression in a folk dance. The Yakshagana of Karnataka, Bhangra and Gidda of Punjab, Bihu of Assam, Garba and Dandiya Raas from Gujarat, Kummi, Kolattam, Karagattam and Kurathi (Gypsy) from Tamil Nadu, Namgen from Himachal Pradesh, Chholiya from Uttar Pradesh, Brita or Vrita from West Bengal, Lavani and Koli from Maharashtra, Ghode Modni from Goa, Hikat from Jammu & Kashmir, Santhali dance of the Santhal tribe, the lion dance from Sikkim, Dholu Kunita from Andhra Pradesh, Ghoomer from Rajasthan and the dances of the tribes in Nagaland are some examples of popular folk dance forms of India. In earlier times, classical dances were confined to being performed mostly within the temple courtyards. 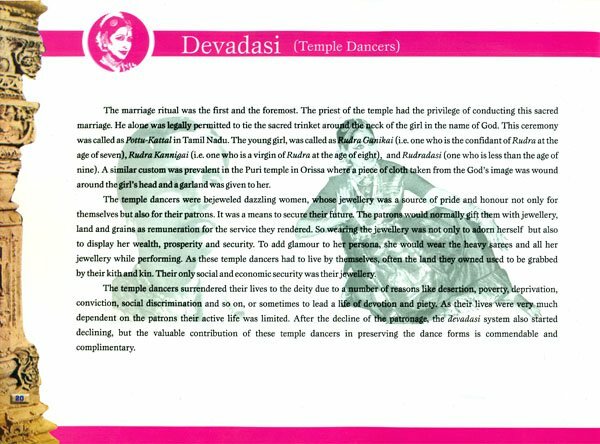 However, in the present times, the expansion of communications and media have played a pivotal role in helping these dances to be performed at various venues other than the temples thus reaching out to a larger mass. The developments in science and technology have further helped in improving the performance of these dance forms. Smooth wooden floor for the stage in place of the stone floor, improved electric lights instead of oil lamps, microphones and loudspeakers to carry the voice of the orchestra to the farthest corners of the auditorium have reduced many hindrances that had been there hitherto in the performances. Advanced audio equipments enable music to be recorded with full orchestra on tape which could be used when there is lack of space (stage) or finance. Audio and video recordings of lectures, seminars, festivals and recitals have provided eternal documents for researchers and scholars. Developments like distance-learning through techniques of video conferencing have enabled people living in the remote parts of the world to gain knowledge about our dances. Various books authored by stalwarts in the field of dance, scholars and connoisseurs have also carried the knowledge and information regarding these dances around the world. Earlier, scholars, gurus, composers, authors and artists of different sections like dance, music, sculpture and painting were patronized by the rulers (kings and zamindars) and heads of the concerned states, cities and villages by being provided all the basic living comforts for themselves and their families, and being encouraged to do pioneering work in their respective fields of art. These days, the onus has been taken over by the governments, art academies, institutions and business houses who are supporting such artistes by organizing art festivals and exhibitions, instituting scholarships, awards, fellowships and grants for pursuing research productions, writing books and in general for working towards furthering the cause of art. Thus the richness of the art that is more than 2000 years old will be preserved forever. With these numerous developments and the ingrained unique style of our dances, Indian classical dance forms have become prestigious components of the cultural heritage of India. India has forever been the epitome of unity in diversity. This spirit of unity in diversity is best represented by our classical dances, each following the same basic text, yet each so unique in treatment. We bow to this spirit of unity displayed by our classical dances - the symbols of our ancient culture and civilization.